Gateway signs are the ideal way to promote your brand on the roadside at the entrance of a village or drive in to a business. The Glasdon Gateway is bright and highly visible and can be configured to different shapes and sizes making it perfect for schools, leisure sites and businesses. Used as a boundary marker sign it is ideal for welcoming road users into towns and villages, while reminding drivers to reduce their speed. The Gateway provides a smart way of displaying both village names and speed limits, which reduces the amount of road signage required and de-clutters the route in. Also perfect for outdoor advertising displays, it can be used for schools, retail parks, leisure sites and businesses on an entrance way to promote your brand. Large in size, the Glasdon Gateway is bright and highly visible and with over 360 different configurations available it can be easily adapted to a wide variety of applications. Create your gateway sign with different widths, heights, colours and bar configurations. 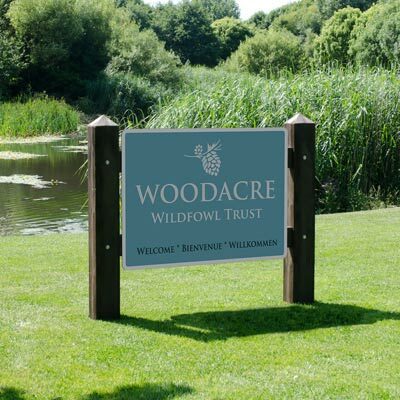 Unlike traditional wooden gates which require regular surface treatment to prevent elemental damage, the boundary sign carrier is made from an Everwood™ Material which is resistant to rust, corrosion, rotting, and can withstand extremes of temperature. These outdoor advertising displays can be easily wiped clean and its low maintenance value ensures they never need painting. Talk to us about your gateway sign requirements today.